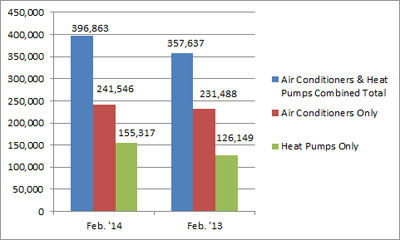 U.S. shipments of residential gas storage water heaters for February 2014 increased 5.8 percent, to 366,057 units, up from 345,853 units shipped in February 2013. 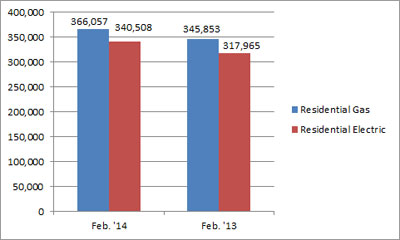 Residential electric storage water heater shipments increased 7.1 percent in February 2014, to 340,508 units, up from 317,965 units shipped in February 2013. For the year-to-date, U.S. shipments of residential gas storage water heaters increased 4.0 percent, to 736,907, compared to 708,857 units shipped during the same period in 2013. Residential electric storage water heater shipments increased 7.2 percent year-to-date, to 702,211 units, compared to 655,076 units shipped during the same period in 2013. 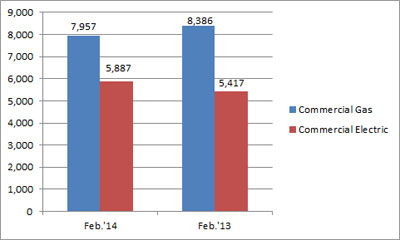 Commercial gas storage water heater shipments decreased 5.1 percent in February 2014, to 7,957 units, down from 8,386 units shipped in February 2013. 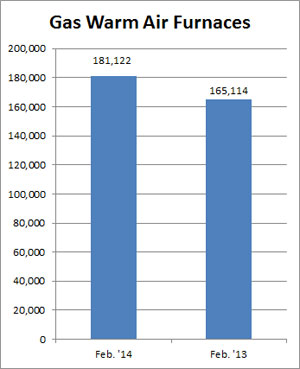 Commercial electric storage water heater shipments increased 8.7 percent in February 2014, to 5,887 units, up from 5,417 units shipped in February 2013. Year-to-date U.S. shipments of commercial gas storage water heaters decreased 9.0 percent, to 15,163 units, compared with 16,668 units shipped during the same period in 2013. Year-to- date commercial electric storage water heater shipments increased 5.2 percent to 11,221 units, up from 10,666 units shipped during the same period in 2013. 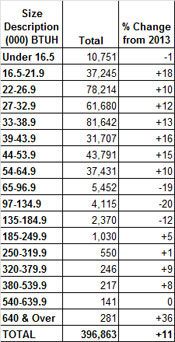 U.S. shipments of gas warm air furnaces for February 2014 increased 9.7 percent, to 181,122 units, up from 165,114 units shipped in February 2013. 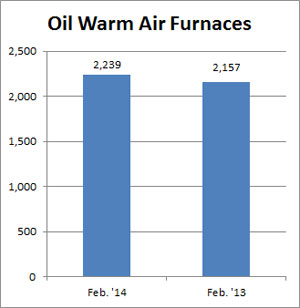 Oil warm air furnace shipments increased 3.8 percent, to 2,239 units in February 2014, up from 2,157 units shipped in February 2013. Year-to-date U.S. shipments of gas warm air furnaces increased 14.2 percent, to 390,789 units, compared with 342,239 units shipped during the same period in 2013. Year-to-date U.S. shipments of oil warm air furnaces decreased 8.7 percent to 4,615, compared with 5,055 units shipped during the same period in 2013. U.S. shipments of central air conditioners and air-source heat pumps totaled 396,863 units in February 2014, up 11.0 percent from 357,637 units shipped in February 2013. 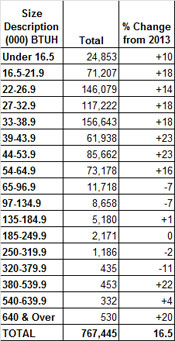 U.S. shipments of air conditioners increased 4.3 percent, to 241,546 units, up from 231,488 units shipped in February 2013. U.S. shipments of air-source heat pumps increased 23.1 percent, to 155,317 units, up from 126,149 units shipped in February 2013. Year-to-date combined shipments of central air conditioners and air-source heat pumps increased 16.5 percent, to 767,445 units, up from 658,813 units shipped in February 2013. Year-to-date shipments of central air conditioners increased 11.1 percent, to 456,608 units, up from 410,980 units shipped during the same period in 2013. The year-to-date total for heat pump shipments increased 25.4 percent, to 310,837 units, up from 247,833 units shipped during the same period in 2013.